Rev. Lisa Fitzpatrick, co-founder of the APEX Youth Center in New Orleans and recently named as a 2013 CNN Hero, has been recognized again for her groundbreaking work with decreasing violence among youth in a city that ranks third among the deadliest in the nation. Selected by 5 Hour Energy as an “Amazing Person,” Fitzpatrick received, on behalf of APEX, a gift of $50,000 to further the ministry of the youth center. (See the interview at http://5hourenergy.com/helps-amazing-people/lisa-fitzpatrick-and-apex/#sthash.Vs3TiA4Q.dpbs ) She has also been honored as one of Harvey’s Heroes, an award given by TV host Steve Harvey, and was interviewed on his nationally syndicated program on Oct. 30. 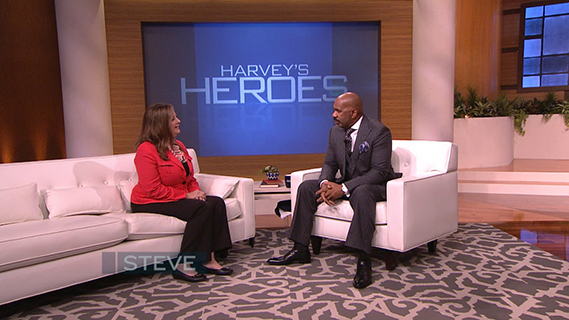 (See the story at http://steveharveytv.com/harveys-hero-lisa-fitzpatrick/ ). Fitzpatrick also had the pleasure of presenting the game ball during opening ceremonies for the season opener game of the New Orleans Pelicans! Fitzpatrick and her team of volunteers extend love and the concepts of conflict resolution to a number of the city’s at risk children, youth and young adults. “Reconciliation, never retaliation” is the organization’s motto, said Fitzpatrick, who also serves as a part-time associate pastor for Peoples and Williams Ross United Methodist Churches in a city which is working to decrease its high murder rate. It is no surprise that this humble local pastor was “shocked” when she received the call to let her know that she had been named one of 25 CNN Heroes for the year 2013. “We’re humbled and honored. This speaks to the amazing work that the kids are doing. They are the real heroes. To live in the midst of daily violence in their neighborhoods, to bear the burdens they bear—their courage and strength is heroic,” said Fitzpatrick, who felt a call to ministry early in life. To find out more about APEX, visit www.apexyouthcenter.org for more information.